University academics had agitated from around 2012, coupling with their demand for a hike in salaries and other perks, for an increase in government expenditure on education to a level equal to 6% of GDP. There was a prolonged strike accompanied by a long march by them to pressurise the Government in power at that time for acceptance of their demand. Yet, the response from the Government was poor. Seizing the opportunity, the United National Party in its election manifesto presented during Parliamentary elections in August 2015 made two promises to the electorate. One was to progressively increase the expenditure on education to 6% of GDP. The other was to increase the expenditure on healthcare services to 3%. Later, Prime Minister Ranil Wickremesinghe, in his economic policy statement presented to Parliament in early November 2015, reassured the delivery of these two promises. Even Finance Minister Ravi Karunanayake, while refraining from mentioning any ratio, elaborated on the need for increasing these two items of expenditure in the Budget Speech he delivered in late November 2015. Thus, the avowed goal of the new Good Governance Government has been to spend more on education and healthcare services for developing a healthy talent base, an essential component of the Government’s social market economy ideology based on both ‘knowledge’ and ‘competition’. The Government expenditure at 6% of GDP on education and 3% on healthcare is not a magic number. A Government can go up to these numbers but could still end up in disaster, if such expenditure is not productively utilised. 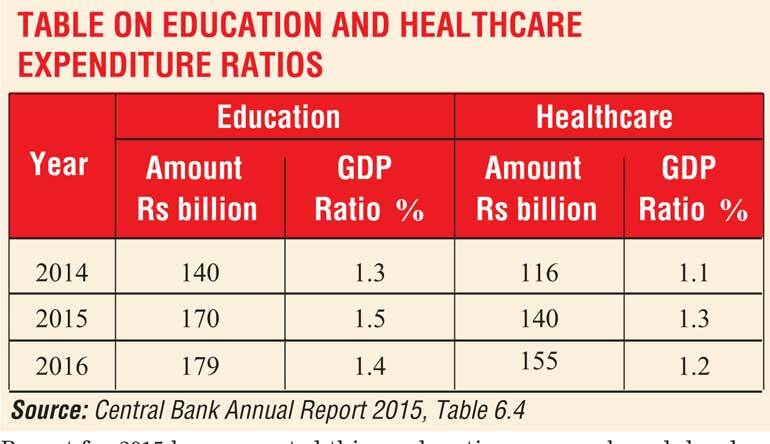 As this writer has highlighted in previous articles, there are many ground conditions that are needed to be satisfied for a nation to get the best out of such expenditure programs (Available at: http://www.ft.lk/article/169481/Inconclusive-debate-over-Sri-Lanka-s-education--Education-may-deliver-garbage-but-remove-garbage-elsewhere-too and http://www.ft.lk/article/484721/Part-6--Social-Market-Economy-%E2%80%93-Education-should-be-reformed-to-create-creative-capital-and-not-mere-human-capital). Education should develop scientists and they should have funds and facilities to conduct research. That research will bring about inventions that lead to technological advancements. Then, there should be entrepreneurs who are willing to take risks by adopting the new inventions made by scientists. Entrepreneurs should be supported by funds and protection so that they could put the inventions into commercial practices. Then, there should be mechanisms for both parties to come together and make available the products they produce to the ultimate users. The need for combining inventions with innovation was elaborated in a previous article in this series (available at: http://www.ft.lk/article/478857/Part-4--Social-Market-Economy--Universities--research-institutions-as-catalysts-of-an-innovation-economy). The users of new products are both within Sri Lanka, called the domestic economy, and outside Sri Lanka, called the global economy. Since Sri Lanka’s domestic economy is small, it cannot gain a sufficient advantage by just producing only for the domestic economy. Its production outfits should necessarily have an eye on the global economy which the Prime Minister labelled in his economic policy statement as ‘producing for a market bigger than the market in Sri Lanka’. But to produce for such a bigger market, Sri Lanka should have access to modern science and technology. Thus, it is a must that Sri Lanka should spend a higher proportion of its income on education, science and technology development that should be associated with proper marketing to generate innovations. The Government has an important proactive developmental role in creating the needed ground conditions for generating technological inventions and then, translating them into entrepreneurial innovations. Its expenditure on education that also includes research and development will meet the first requirement. To meet the second, it should have a business-friendly economic policy package. Such a policy package should have many components. One is that it should ensure property rights by observing the rule of law and maintaining law and order. Another is that it should facilitate the quick and fair enforcement of contractual arrangements without taking sides. A third relates to basic good governance principles that ensure ‘freedom of thought and freedom of expression’. This is because inventions come from free thinking and these two freedoms are the basic raw material for free thinking. These three requirements are interconnected and they feed on each other. Thus, if one is absent, the other two too will quickly disappear. Recognising their importance, the World Development Report 2013 has highlighted the need for permitting people to express their opinions by giving voice to people and creating opportunities for public discussion. This is because inventions and innovations are changes and changes cannot be brought about without questioning the prevailing order. The suppression of people’s right to question what they see as incorrect will surely create a nation of slaves and not a nation of thinkers. Having an ambition is one thing, but realising that ambition is another. For that, a Government has to direct all its resources and energy until it is satisfied that it has in fact realised its ambition. Hence, it is not a onetime short-term affair that a Government can forget quickly. Rather, it is a long-term policy challenge which it should be ready to take with proper direction of the resources under its command. When the Budget 2016 was presented to Parliament, there was a blunder which the Ministry of Finance had made with respect to expenditure on education and healthcare services. As a mirror image, this blunder had been repeated on the non-tax revenue side of the budget as well. This was highlighted by this writer in a previous article in this series immediately after the Budget 2016 was presented by the Minister of Finance in Parliament (available at: http://www.ft.lk/article/507663/Budget-2016-and-education-and-health-expenditure--Playing-numbers-games-isn-t-in-accord-with-good-governance-principles---Part-5 ). In a nutshell, the blunder is as follows: The Ministry of Finance had added an imputed annual rent value of the buildings belonging to the education and health authorities as current expenditure items in the respective votes. In the case of education, it amounted to Rs. 121 billion; in healthcare, it was Rs 18 billion. On the revenue side, the total sum amounting to Rs. 139 billion had been added as non-tax revenue. The same practice had been repeated in the case of the budgetary projections done for 2017 and 2018 as well. The effect of this practice has been to inflate both the revenue and expenditure figures of the Budget thereby misleading the public. It had, thus, misleadingly reported higher revenue to GDP ratios, on the one hand, and healthcare and expenditure to GDP ratios, on the other. Accordingly, the Ministry of Finance was able to paint an improved budgetary performance before the ill-informed public. As this writer had pointed out in the article under reference, the budget numbers do not stand alone in a macroeconomic system. Government expenditure and revenue are related to economic growth data, while its borrowings are related to money and credit data in the macroeconomic system. In addition, its foreign borrowings are related to the balance of payments data. Hence, the budget should be consistent with the other three sectors of an economy. Therefore, to avoid ambiguity, inconsistency and misreporting, the countries in the world present their macro numbers according to global standards set by mutual agreement. Growth data is compiled in accordance with the System of National Accounts or SNA released by the United Nations. Similarly, budgetary numbers are presented in terms of the Government Finance Statistics Manual or GFSM, balance of payments in terms of the Balance of Payments Manual or BPM and money and credit data in terms of the Monetary and Financial Statistics Manual or MFSM, all released by IMF. When preparing these manuals, IMF has taken care to maintain consistency with the global best practice as presented by the UN in SNA. Hence, responsible countries cannot report their numbers arbitrarily but in accordance with the global best practices. According to GFSM and SNA, not all the expenses coming within a ministry would be recorded as education or healthcare expenditure. In the case of education, it consists of direct and collective expenditure incurred by the Government on behalf of pupils who include those in the primary, secondary, tertiary and vocational institutions. The collective expenditure covers items such as preparation of course curricula, textbooks and conducting public examinations, etc. Accordingly, if the Minister of Education gets a Benz car, it is not an expenditure directly benefiting pupils and therefore, should be excluded from expenditure on education. Similarly, salaries paid to Ministry or Departmental officials are not expenditure on education but on the general administration of the Government. Similarly, healthcare expenditure too consists of only those direct and collective expenditure items incurred by the Government benefiting the patients. As such, ministry votes are a poor guide to ascertain the actual expenditure incurred by the Government on education or healthcare services. Hence, after the Budget has been passed by Parliament, the Central Bank officials sit down and reclassify the budget numbers according to their actual functions by following the guidelines given in GFSM. The numbers so prepared are presented in a special table in the Central Bank annual report under the heading ‘functional classification of the government expenditure’. Until this table is published, no one can make an accurate assessment of how much money the Government has spent on both education and healthcare services. The Central Bank in its Annual Report for 2015 has presented this table on page 188 as Table 6.4. Table 1 here shows the numbers relevant to education and healthcare services during 2014 to 2016 together with their GDP ratios. Education expenditure to GDP stood at 1.3% in 2014. It marginally improved to 1.5% in 2015. But according to the reclassified budgetary data for 2016, the ratio has declined slightly to 1.4%. A similar pattern is observable in the healthcare to GDP ratios as well. In 2014, this ratio stood at 1.1%. It marginally improved to 1.3% in 2015 but is expected to fall to 1.2% in 2016. This is not a trend about which the new good governance Government can be happy at all. It demonstrates that the Government has abandoned the objective of progressively increasing public expenditure on education and healthcare services to a higher level. This will definitely bring about some disastrous results for the future sustainable economic growth of the country. The Government is facing a dilemma today. Surely, the numbers presented above cannot make both the Yahapalana Government and those who brought that Government to power happy. It has to make some critical choices involving both the income and the expenditure of the Government. The Finance Minister elaborates this choice at every public forum expressing his commitment to consolidate the budget by 2020. What he means is that he would bring down the budget gap to a reasonable level by raising revenue and pruning expenditure. But those measures are unpopular and have the risk of being exploited by the Government’s political opponents making the choice more difficult. What should the Minister of Finance do? The way forward for him has been graphically elaborated in the ‘Pot of Thrift’ presented in the article. Thrift simply means the quality of using money and other resources carefully and not wastefully. It is a good habit being taught to everyone, if he is to escape being indebted, a malaise making one’s life miserable. It is equally valid to a Government as well. The present Government is blaming the previous regime for inheriting it a massive amount of debt, the annual repayment of which requires it to spend more than its revenue. Any private citizen might become bankrupt and would be at the mercy of his creditors if he is to use continuously more than what he earns to settle his debt. But, a Government with its powers to borrow and print money has been able to continue for some time before it too reaches its limits. Unless the promised budget consolidation is delivered, the Sri Lankan Government too is fast heading in this direction. Hence, it is all the more important for the Minister of Finance to use money and other resources available to him carefully and not wastefully. 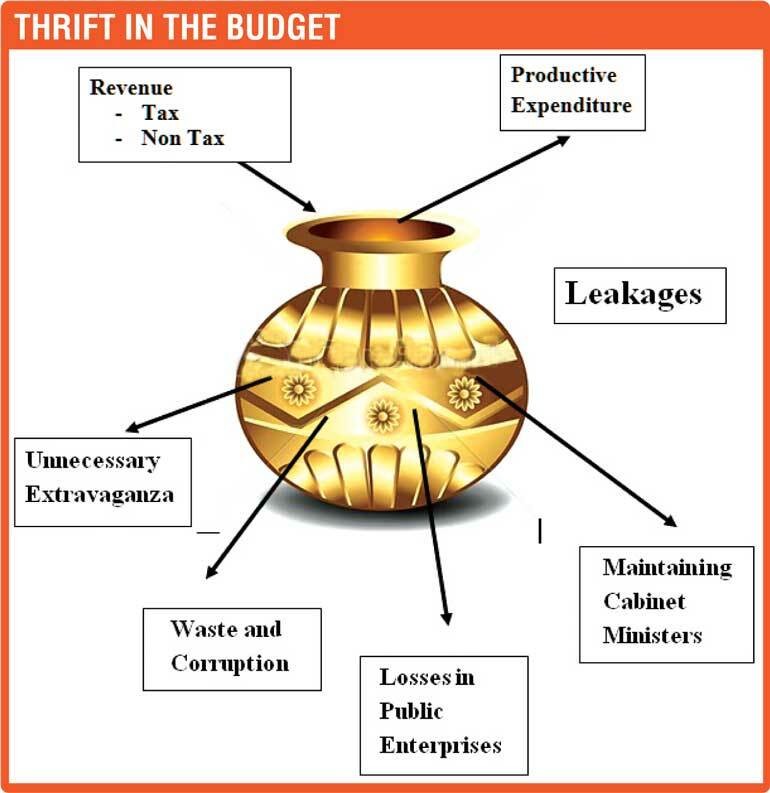 The pot shows how it is filled with revenue and how money is taken out of it for productive expenditure programs. Since filling of the pot has its own limitations, all what the Minister of Finance can do is to use its resources for productive expenditure programs. Spending money on education, research and development and healthcare services belong to this productive type of expenses. But unknown to the Minister, there are holes in the pot through which the scarce resources within it are leaked out. He should immediately plug those holes. One hole is the maintenance of a jumbo team of Cabinet colleagues with all kinds of invisible and hidden perks and facilities. The monthly salary paid to a Minister in Sri Lanka is peanuts but the hidden perks amount to millions of rupees charged to taxpayers. A simple calculation done by taking into account all the known perks reveals that taxpayers have to spend a minimum of Rs. 6 million a month to maintain a minister in Sri Lanka. It is true that a decent salary should be paid to a minister if the taxpayers are to receive a comparably better service from him. But in a situation where the country is faced with a tragic budgetary constraint, this has to be reviewed and consensus should be reached among the Cabinet ministers to go for a voluntary cut in perks. It will give a good example to the rest of the citizens who are called to accept austerity as a necessity in the current circumstances. The other holes are more alarming. Losses in public corporations, extravagant expenditure programs and money lost in waste and corruption have drained the limited budgetary resources of the Government. According to the annual reports of the Ministry of Finance for 2014 and 2015, the total losses of the five big money losers, namely, CEB, CPC, CTB, SriLankan Airlines and Mihin Air during 2013-16 had amounted to Rs. 79 billion. The Ministry of Finance has to find money to recoup these losses at the expense of curtailing the productive expenditure programs elsewhere. Waste and corruption increases the Minister’s bills above their legitimate levels. Politicians and top bureaucrats have been dancing on the floor wildly quite oblivious to the perilous state of the Government’s finances. They return to the dance floor after guzzling from the punch bowl which is continuously filled by the Minister of Finance through supplementary allocations. It is time for both the President and the Prime Minister to take the punch bowl away to put a stop to unnecessary extravaganzas and galas. It is, therefore, necessary that the partners of the Yahapalana Government should put up a united face before the public and take measures to plug these holes. If the Government could do so, the electorate too would welcome it wholeheartedly. It is better to show this good gesture immediately rather than postponing to a future date. The Government cannot just ignore these holes in the pot and continue to blame the previous administration for all the economic ills which the country is having today.